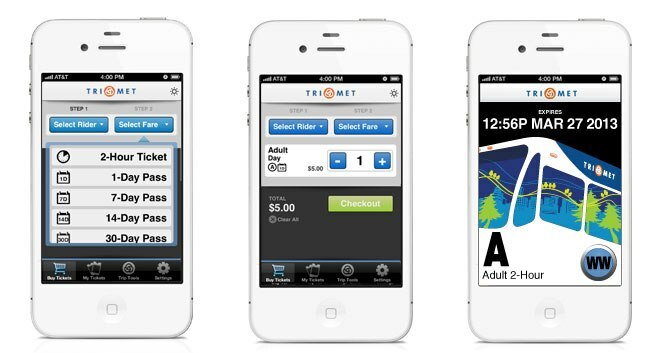 The TriMet Tickets mobile app becomes available to the public this week. To celebrate, TriMet is inviting riders to a launch party on Wednesday, Sept. 4 from 10 a.m. through 11 a.m. at Portland State University’s Urban Center Plaza located on SW Montgomery between 5th and 6th avenues in downtown Portland. TriMet staff, the app developers from GlobeSherpa and beta testers will be on hand to help customers download the app and get riding. We’ll have refreshments and music by Martin Zarzar of Pink Martini fame. With the TriMet Tickets app you’ll be able to easily buy tickets on your Android or iPhone – anywhere at any time. With a few taps on the screen, your ticket will be right there in the palm of your hand. Use it to ride buses, MAX trains, WES Commuter Rail and the Portland Streetcar. Starting September 4, download the free TriMet Tickets app from an Android or iPhone app store. Register your account and load your credit or debit card information into the secure system and then you’re ready to buy tickets. It’s that easy! For more information and a how to video, visit trimet.org/mobiletickets.